Note - this bus is currently in our workshop building and not on regular display. This bus was new in 1953 to Messrs J W Camplin & Sons, trading as "Holme Delight", of Donington, near Spalding, Lincolnshire. This was a small family operation, whose fleet consisted of about 10 vehicles, mainly coaches. FDO 573 was the company's first double decker. A second AEC followed in 1955. This vehicle includes what were in some respects advanced features for the early 1950's - platform doors (hand operated), air brakes and air operated 'pre-selector' gears (these were features in common with the London 'RT' class, which was a variant of the Regent III model.) The lower deck was upholstered with a bold red patterned moquette, the upper deck seats were a more basic red vinyl. 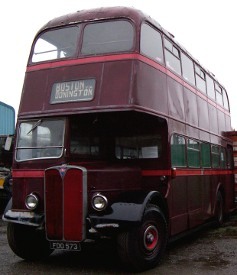 This bus spent almost all of its working life on the Boston - Donington - Spalding route of 'Holme Delight'. Its final days in service were in the early 1970s with Kimes Coaches of Folkingham who took over the business of Holme Delight in 1970, and still operate the Boston - Spalding route (although no longer with AECs!). More about Holme Delight, and a 1963 timetable for the Boston - Spalding route can be seen here. A colour photograph in Kimes' livery can be seen here. October 2010 - An air leak has been repaired on the gauge line and the charging valve serviced. A new flexible exhaust pipe has been fitted and welding work undertaken on the drop frame and front offside wing.